It has been a while since I've updated my Blog about the progress of our app to better manage your warehouse operations. So here is an update that spans about 5 months of development. First of all, I want you to realize that I feel that this app is one of the most important new products for NECS to offer you. It solves so many issues for your warehouse, that I can see almost all our customers finding immense benefits from it. And for those of you that aren't sure about that, it is probably because you haven't experienced it yet. If you have spent some time looking into third party software for warehouse management, you've probably been shocked by the cost. For most warehouse management software, the cost of the hardware and integration into your entree software can easily approach $100,000 (for a 5-10 scanner system). Our pricing is dramatically lower and runs on inexpensive Android devices. Our goal is to provide a robust system, with seamless integration into entree at an affordable price point for our customers (about 1/10th of the cost of other systems). Just from the feedback we received from our beta users, not only is it eliminating mistakes, speeding along the order picking process, eliminating functions in the office and changing how they do things in the warehouse; but they are finding that at least one job function in there operation is completely eliminated. Not that I want to see employee's loose their jobs, but in this tough economy, why have additional resources on your payroll that simply are not needed because of the effeciencies new technology creates? In September 2012 we officially released version 1.0 and changed the name to the ELECTRONIC WAREHOUSE MANAGER or EWM for short. As it turns out, this app is going to do much more than just automate the Loading Sheet / Picking process, so we wanted to change the name to reflect that. A couple of weeks ago, I finally had our website updated to include a special section for the EWM. You can find it in the "Mobile Apps" menu dropdown off our homepage of www.necs.com. Or you can click here for a direct link. Here you can find the latest hardware we are recommending, pricing and the "Features" section will show all the latest screen shots with explanations. Version 1.0 included some new features and refinements as suggested by our brave and extremely cooperative and helpful beta users. Big thanks go out to George's Seafood in Norfolk, VA and SRA Foods of Birmingham, AL! This Blog posting will describe those new features as well as inform you about what we are working on next for the EWM. As reported by our beta users, their warehouse workers were finding it a little cumbersome to work with a 10" tablet. So when Google released the very fast and durable 7" Nexus tablet, we decided to optimize the EWM's usage for the smaller screen size. Not only is the Google Nexus 7 very fast and easy to hold, it has an excellent price point of only $199. This is now our recommended tablet (along with the Socket Mobile laser scanner). For more specific information regarding the Google Nexus 7 and Socket Mobile scanners, click here, then select the "Technical Specs" tab. There are so many visual things we can do with this app to help your warehouse crew do their job more effeciently, that just were never possible before. To give you an idea, we added a simple progress dashboard that can be viewed during the Loading Sheet, Picking and PO Receiving areas. The below screen shot shows this live dashboard that constantly updates as work is accomplished. The left side of thedashboard shows a progress gauge that indicates how many items of that process have been completed. For example, if picking a customers Loading Sheet of 60 items, as items are picked, it will advance as all 60 are finally picked. The right side of the dashboard shows a "stacked bar chart", which indicates the completion progress for each Temperature Zone and Add-On items. The chart starts off as green lines, but as progress continues the lines start to turn red until that zone is completed. This allows the warehouse user to complete their task faster, as they do not have to constantly scroll up and down for items that still need to be picked or received. The visual dashboard provides them with a quick view of how their progress is advancing, and how much work is left to do. An overwhelmingly popular request from our beta users was the ability to easily handle "Item Substitutions" when picking a customer's order. Of course, for your warehouse user to have this ability, there are certain authorization settings you need to set. Items are substituted by touching the 'Sub' button on the pop-up number keypad. Here a defined substitution can be selected, or the item number of a manual substitution can be entered. • The warehouse user has the ability to always perform substitutions as required. • The warehouse user can only provide a substitution with a supervisor's verification (by the supervisor entering their password on the users tablet). • The warehouse user is never allowed to perform an item substitution. When an item substitution is being performed, the tablet will display the defined substitutions (up to four) as entered in your entree Inventory File maintenance screen (located on the 'Misc 1' tab). If no substitutes have been pre-defined, then the user will be allowed to enter the item number of the substituted item. This item number will be saved in your entree Inventory File maintenance screen, if any of the four pre-defined substitution fields are available, for the next time this item may need to be substituted. The next release of the EWM will allow the user to simply scan the item they are substituting, instead of typing in the item number. Another feature to help your warehouse crew during the picking process of a customers order, was including the "Pckd" column (far right on the form) along with the "Remove Pckd" toggle button. However, if total quantity required has either been scanned or manually entered, the box will automatically turn to a green check mark. If it turns out that the item will be short shipped, the warehouse user can manually touch the box to indicate that picking is complete for that line item. To further aid in the picking process, the warehouse user can press the "Remove Pckd" button. This will remove all the line items automatically from the screen that have been picked, with the result of only showing the items left to be picked. This is very useful for large orders to avoid scrolling up and down to see what line items are left to be picked. Customer order "Add-Ons"... you love them and you hate them! The EWM app helps you eliminate the "hate" part because it keeps all those things in the warehouse related to the paper based (printing Loading Sheets) order picking process that can go wrong and cost you time and money (ex: double picks, missed picks), to be better organized. Note that the above screen shot (from #4 above), applies to this section as it shows the "Add-Ons" feature enabled. Because the entree software allows you to easily revise a customer invoice, including adding last minute customer requests for additional items, this can cause picking confusion in your warehouse when printing Loading Sheets. Note that each time a customer's invoice is revised, the entree software will attach a 'revision letter' next to the invoice number. For example, if invoice number 234561 was revised twice with multiple items added, the invoice number will be appear as 234561B. The 'B' is simply a code to show that it was revised two times. A 'C' would indicate three times, etc. This means you could have multiple copies of the printed Loading Sheet causing confusion in the warehouse. Pickers may not realize that the add-on's have already been picked, causing double picking errors which waste precious time and resources. Sometimes pickers may not realize that the add-on's were never picked, ultimately causing delivery shortages and upset customers. And then guess who has to run out to the customer to deliver his emergency missing items? The above problems are usually compounded the more item add-on's and revisions are made. Ah, the joys of a paper based system. By utilizing the 'Add-Ons' filter on the EWM Loading Sheet screen, the pickers will clearly see what items were added to each revision of the invoice and if those items have been picked yet. Problems solved! This filter is a fantastic option to keep your picking processes working flawlessly when dealing with last minute item add-on's to existing invoices. The new "Purchase Order Receiving" option allows the user to view and receive open purchase orders when the product is delivered to the warehouse. The user is allowed to receive both quantities and weights for incoming product, but will not have access to any cost information. 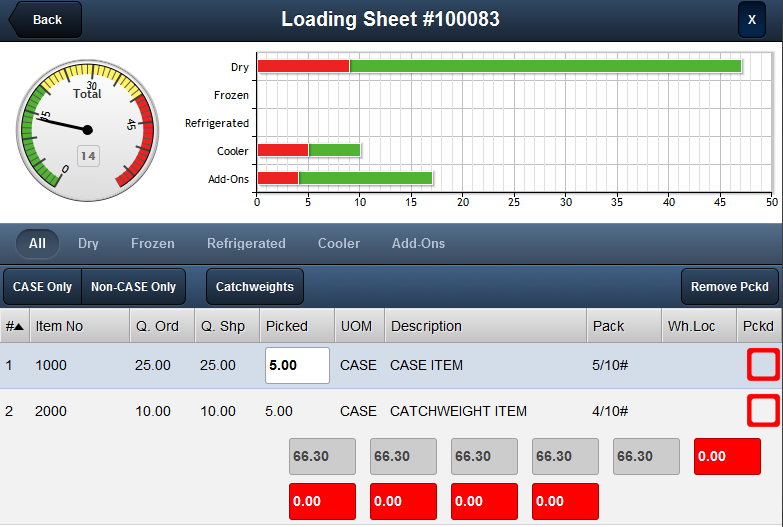 Based upon the receiving date parameters (defined at the bottom of the screen), all vendor's which have open purchase orders will be displayed as red truck icons running down the left side of the screen. The truck icon will include the name of the vendor and the number in parenthesis indicates the number of open purchase orders for that vendor. Touching a vendor's truck icon will change the truck's color to blue and display a listing of the specific open purchase orders for that vendor.They will see the last received date and number of cases for each. Many of our customers, including one of our beta sites, process their own items (meat, poultry, pork) for sale. Because of this, there are needs related to processing that the EWM was born to solve. One of these is the need to produce barcoded item labels as inventory is manufacured, and placed on the finished box. This applies to both "catch weight", "constant weight" and normal type items. • A waterproof Android tablet is mounted above a weight scale. The tablet is connected to your server via WIFI. The scale is wirelessly connected to the tablet via Bluetooth. 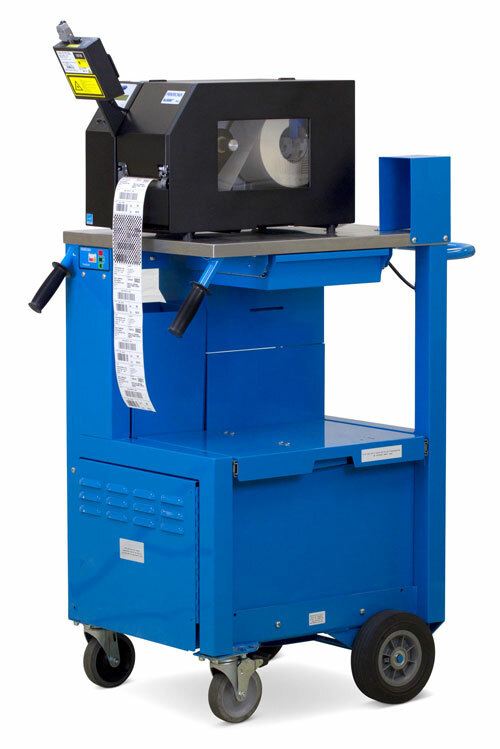 • Next to the scale is a high speed thermal label printer, connected to the network (either wired or wireless). • When starting the production run, the user will select the item being produced on the tablet. • The user will be instructed to place the item on the scale, with tare weights being fully supported (if a catch weight). • The weight appears on the tablet from the scale, and the the processing room user touches a large "Print Label" button. 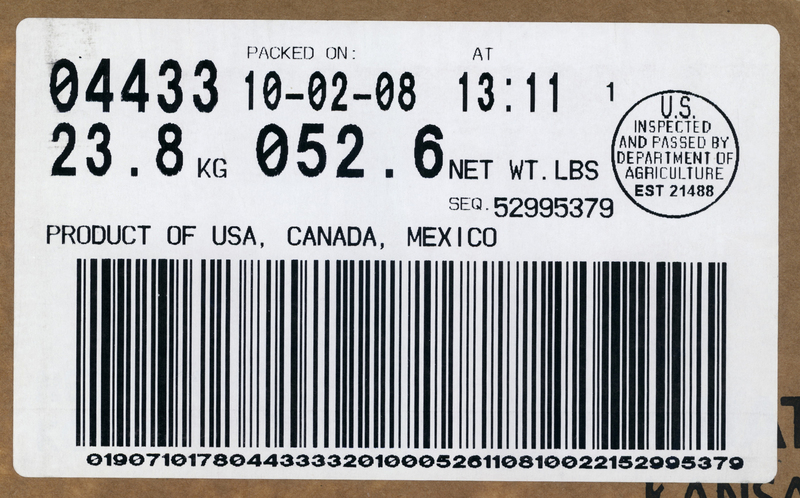 • The barcode label is printed (in less than a second) with the proper weight, lot number, production date, etc. • The label is placed on the box, and the user is prompted to put the next box on the scale. This process continues until that item is finished in production. • Non-catch weight items can have their labels produced in bulk. For example, if 50 cases are produced, 50 labels can print all at once. There are steps and features I've left out, but the above should give you a general overview of this process will work. Note that inventory can either be automatically updated as labels are produced, or you can choose to use the "PO Receiving" process in the EWM to scan them into inventory (if your internal accounting processes require your processing department to be setup as a vendor). A process that all our customers must deal with is managing their physical inventory. It's one of those things that are never looked forward to, but a necessity for a distribution operation. We have some very large goals for the EWM to help you with this, and we will be rolling them out next year. One thing that I want to mention to start is a weakness entree has with managing multiple warehouse locations for items not tracked by Lot. We will be addressing this both in version 4 of entree, as well as the EWM app, because successful warehouse management and counting your inventory depends on this. You can expect more detailed information about this in the next few months. Part of the solution include a new "Warehouse Location File Maintenance" option where you can define each location in your warehouse including the aisle, slot, level, overflow, reserved, cubic feet capacity, etc. Version 4 of entree will also include a "Flag to Count (Y/N)" feature in Inventory File Maintenance and during the Create / Change Purchase Order options (because your buyers are many times the first to spot inventory on hand issues, and ordering the correct amount of inventory is crucial to their job function). Basically this allows you to flag specific items to be counted whose quantities do not appear to be accurate. And of course their will be true "Cycle Counting" features where you can perform counts on your fastest moving items, highest cost items or items withing a specific warehouse location or zone. The counting process fully supports barcode scanning as well as manual input of quantities and weights. In the example above, the provolone cheese is being counted. Every time a product is scanned, or a manual entry is made, that information is recorded included the identification of the warehouse user who did the count. As we finalize the operation of this screen, more information will be provided to give you an explanation of how everything works. 3. 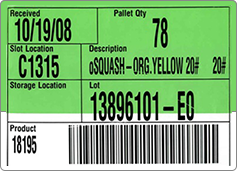 PO Receiving Labels / Pallet "License Plates"
For your warehouse to be truly automated, you need barcode labels on all your inventory, and in some instances, labels for the actual pallet (called a "License Plate"). You also need barcoded warehouse "location" labels for each location/slot where product is stored. From feedback received by many of our customers, it appears that about 80% of your existing inventory has a barcode label. That leaves about 20% of inventory that can slow down the speed and mistake proof advantage that barcode scanning brings to the EWM. In order to solve this issue, the next release of EWM will include the ability to generate item barcode labels and pallet "license plate" labels during the Purchase Order Receiving process. The EWM will generate internal tracking lot numbers and serial numbers in the barcodes of these labels for even greater inventory control features. These labels can print on a high speed thermal printer in your loading dock area, via a portable label printer worn on the belt or a battery based portable print cart you can wheel around your warehouse. For more information about this very cool, portable, battery powered print cart made by Printronix, click here. We are always on the lookout for innovative handheld scanners for the warehouse, and just this week we were sent a demo unit of the latest offering by Honeywell. It's the known as the Honeywell Dolphin 70e smart device, or the "Honeywell Black" for short. It has a great price point (around $1,200 I am told), has a built in scanner and is rugged enough for warehouse use (waterproof, bright display, can work in the freezer and survive constant drops to concrete). 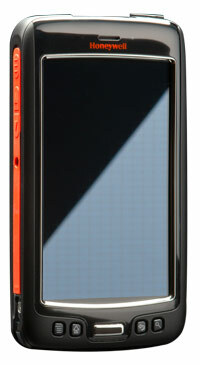 However it has a screen size smaller than we designed the EWM for. It will take some re-design of the EWM app, but this is a device that might suit many of you well. We will be working with it over the next few months, and will make an annoucement when / if we decide to officially support it. Having the built in laser scanner is a big plus. Not only will it make the scan time even faster (at least 100 scans/minute), but will not require a seperate laser scanner. Honeywell tells us it will be available for sale around March of 2013. Click here for more information. Thanks for taking the time to read through this Blog posting! Your questions and feedback are always welcome. Send them to: chris@necs.com. My next posting will deal with entree version 4 SQL, and provide some guidance as to what you will need to do before you install it, as well as explanations for some very important differences you will need to understand related to working with SQL databases.